In an effort to try and make those darned quarterlights open easier, I thought I'd try replacing the old seals. The other benefit might be that it'd cut down on wind noise while driving. It's touted as a bit of a pig of a job and it is a bit involved. So the first thing is to remove the door trim, then loosen off the two lower brackets which hold the glass channels in place. This will allow the quarterlight to be lifted up once you have also taken out the two hidden bolts behind grommets near the hinge. 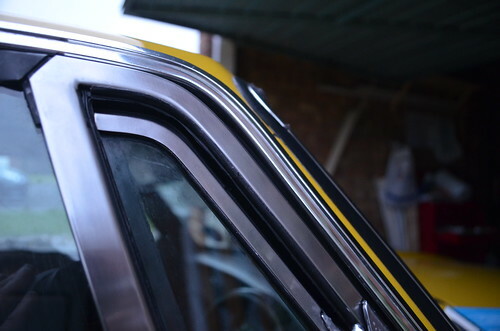 The tough part is actually raising the assembly out of the door to access the bolt on the underside which allows you to lift out the small window, due to the angle of the sprung bolt. The assembly also has the leading edge of the window channel attached, and if you aren't also taking out the glass you'll have trouble getting it free of the door due to the angled bracket at the end. However you should be able to lift it enough to change the seal on the base of the assembly and access the sprung bolt. Once the sprung bolt is released the small window will just lift out exposing the seal. The seal came out pretty easily, the new one took a bit of persuading. No real difference in wind noise but at least the window opens easier now.